As you embark on your journey across the Tides of War, enjoy new modes, battlefields, gear additions, and more coming with each chapter. With eight maps set in frozen landscapes, desert heat, and everything in between, eight exciting game modes, single-player War Stories, outstanding gunplay, a wide arsenal of weapons, vehicles, and gadgets, progression, customization, Specializations for weapons and vehicles, and much more – you’ll have tons to do at the November 20 launch of Battlefield V.
However, that is just the beginning. 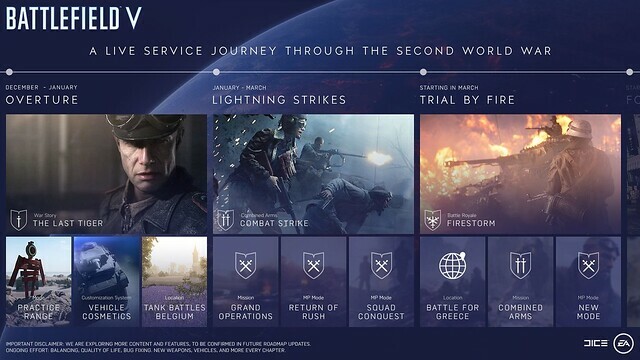 There's also everything coming in Tides of War, the live service for Battlefield V.
As the Tides of War journey kicks off, each of its chapters will evolve and expand the battlefield. What will this mean to you as a player? Starting off in broad terms, below is what you can look forward to post-launch. Evolving Gameplay: Thrilling ways of experiencing Battlefield V will be added through fresh Fortifications, and Reinforcements. Iconic WW2 hardware like vehicles, weapons, and gadgets will also be added. New Experiences: Play through a new single-player War Story dubbed The Last Tiger, co-op with a friend in Combined Arms, do battle royale the Battlefield™ way in Firestorm, experience new game modes and Grand Operations, and hone your skills in the upcoming Practice Range. An Expanding World: You’ll get to deploy on fresh maps as chapters bring new battlefields. Shortly after launch, this starts with Belgium and the Panzerstorm map with tank-focused gameplay, expanding to the battlefields of Greece – and the journey will continue. Game Improvements: Quality of life updates will regularly improve Battlefield V, fix bugs, and balance the game. Tank cosmetics, for the 10 secs your in it until it blows up and then can never get in one again. A Called in super tank backed up by a light anti infantry tank to keep those explosives off the armor and two guys with repairs tools. A 4 man squad that still needs a medic.